After only managing to see 'Cowboys & Aliens' on Day 1, I actually managed to see some stuff on Day 2. Read on for short reviews of two raucous comedies, '30 Minutes Or Less' and 'The Guard' - the latter of which is out tomorrow. As well as some other stuff. Getting to The O2 in the middle of the afternoon was particularly poor work as I was pretty much late for '30 Minutes Or Less', the Aziz Ansari-Jesse Eisenberg buddy action-comedy that I'd really wanted to see. Much like everything else at the event though, it started slightly late - something I wasn't overly bothered by throughout the weekend. The late start meant that I queued just about early enough to squeeze in. '30 Minutes Or Less' proved to be worth the mild stress of getting in - a raucous comedy that will appeal to the 18-34 male demographic, in particular. Somewhat remarkably, all the main characters are likeable in their own manner despite a universally common trait of being annoying at one time or another. Good work from Ruben Fleischer, the director of 'Zombieland'. Immediately after the film, I headed over to queue for the secret screening. Friday's secret film turned out to be 'Warrior' and having heard that this one would be the Ryan Gosling vehicle (chortle) 'Drive', I was very much hoping to get in. Alas, it wasn't to be. Firstly, we were made to leave the cinema and queue outside before being told there was no chance of getting in. Oddly, we were also repeatedly told there was no chance of getting into anything else bar three screenings that evening. Which turned out to be a massive lie. In retrospect, I'm annoyed about this as I'd have liked to have seen 'Crazy Stupid Love', also starring Mr Gosling but with Emma Stone and Steve Carell. A screening which I know other press made it into. To be fair though, I was given a ticket to guarantee entry into 'The Guard' later as a consolation prize - although bizarrely this screening wasn't listed anywhere. Despite the "disinformation" of earlier in the evening - as Brendan Gleeson's ludicrously brilliant character might say - I really enjoyed 'The Guard'. Its unique, risqué humour stands out and Glesson's small-town police officer is really quite something. I don't want to call it the Irish 'Hot Fuzz' but its final shootout and sense of humour reminded me of Edgar Wright's film. Seeing as I had time to burn prior to 'The Guard', I actually went around the exhibitions/stalls and even attended a panel. I'm not a "movie convention guy". I'd rather watch three new films than go to panels and watch clips spoiling films not even coming out this year. 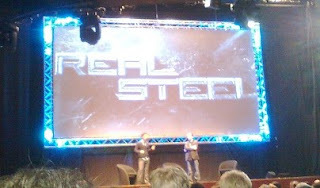 But I might be a convert - Shawn Levy's panel for 'Real Steel' was actually pretty great. There's a high chance the film might be pap (how many more fighting robot films do we really need?) but Levy appears to be a very nice bloke. He even gave away three pairs of ticket's to the 'Real Steel' premiere, while discussing things like taking advice from his exec producer Steven Spielberg and how Sugar Ray Leonard worked as the film's boxing consultant. Minutes later, I unexpectedly saw Mr Levy again basically saying the same stuff as he took over the press room to do a press conference. Before all that though, I explored some of the stalls dotted around the "Hollywood Boulevard". Neil of The Incredible Suit fame recorded a short video tour of the area, which you can watch below. I wisely declined getting a poster for 'The Smurfs' film. Read more on the Empire Big Screen at empirebigscreen.com.